Artist's impression of the environment of a young star, showing the geometry of the dust disc in the outer area and the hot gas disc closer to the central star. Note that the image is not to scale and the inner gas disc, which was studied by the astronomers using ESO's Very Large Telescope Interferometer, is smaller than the distance between the Earth and the Sun, while the whole disc is tens of times larger. TheEuropean Southern Observatory's Very Large Telescope has given astronomerstheir most detailed look at how infant stars feed off the disks of gas and dustthat swirl around them as they grow. Galaxieshave regions where large amounts of gas and dust are concentrated. If the gasis cold and dense enough, clouds of it will collapse and begin to form stars.The stars continue to feed off the surroundinggas as they grow. The disk of dust and gas can also give rise to a planetarysystem, as it did in our own solar system. Observingyoung stars can help astronomers better understand the processes that control starformation, but the closest star-forming regions to us are about 500light-years away. Their great distance makes these gas disks appear very smallin Earth's sky, so specialized techniques must be used to look for fine detailsin the structures. Aninternational group of astronomers used two such techniques to probe the innergaseous environments of six young stars belonging to the family of HerbigAe/Be objects, which are a few times the size of our sun and still growing.The findings are detailed in the October issue of the journal Astronomy& Astrophysics. One of thebest ways to resolve far-away features is interferometry, a technique thatcombines the light of two or more telescopes so that the level of detailcorresponds to what would be seen by a telescope with a diameter equal to theseparation between the two telescopes, which can be hundreds of feet apart. The VeryLarge Telescope Interferometer (VLTI) has allowed astronomers to achieve aresolution of about a milli-arcsecond, an angle equivalent to the size of theperiod at the end of this sentence seen from a distance of 31 miles (50kilometers). Theastronomers combined interferometry with spectroscopy, or splitting light intoits constituent colors, to examine the gas emission processes around the youngstars, which can be linked to the physical processes involved in the stars'formation. Astronomers have long debated what exactly causes these gasemissions. "Theorigin of gas emissions from these young stars has been under debate until now,because in most earlier investigations of the gas component, the spatialresolution was not high enough to study the distribution of the gas close tothe star," said study co-leader Stefan Kraus from the Max Planck Institutefor Radio Astronomy in Germany. "By combining spectroscopy andinterferometry, the VLTI has given us the opportunity to distinguish betweenthe physical mechanisms responsible for the observed gas emission." 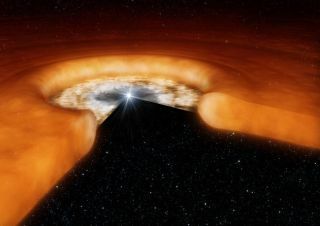 Most interferometryso far has studied only the dust that closely surrounds the young stars, butastronomers wanted to get a closer look at the gas in the same region because"dust is only one percent of the total mass of the disks. Their maincomponent is gas, and its distribution may define the final architecture ofplanetary systems that are still forming," said Eric Tatulli of theObservatoire de Grenoble in France and also a co-leader of the study. Twoprocesses were suspected to be behind the gas emissions observed coming fromthe disk: material falling onto the star and gas being ejected as a wind fromthe disk. The study found evidence of both. Of the sixstars examined, two showed evidence of infalling material. Four other starsshowed evidence of mass outflow, either as an extended stellar wind or as windcoming from the disks surrounding the stars. For one ofthe stars, it seemed that dust might be present closer to the star than wasexpected. The dust is so close that the temperature should be high enough forit to evaporate, but since that was not seen to be the case, astronomerssuspect that the gas in the area shields the dust from the star's light. The newobservations have shown that it is possible to study gas in the disks aroundyoung stars, and future observations could yield even more valuable informationabout howstars form. "Futureobservations using VLTI spectro-interferometry will allow us to determine boththe spatial distribution and motion of the gas, and might reveal whether theobserved line emission is caused by a jet launched from the disk or by astellar wind," Kraus said. The studywas partly funded by a grant from the Italian National Institute forAstrophysics, as well as the Agence Nationale de la Recherche (ANR) of France and by the Programme National de Physique Stellaire (PNPS).